Shaz by the Sea: Thanksgiving Wrap-Up, Happy December! Well, I suppose my posts over these last few weeks make more sense now. I mentioned I was trying to eat more protein (the average person needs about 45g/day and the average pregnant lady needs 70g/day...and I have two babies in there!). I have also been overly emotional and homesick recently and of course, couldn't wait to fly back east for Thanksgiving to tell everyone the big news in person. My parents reactions were absolutely priceless. Shout out to Linds for capturing it all on video. I sent it to a few of my friends and they thought it was either hilarious or it made them cry. You can seriously feel my moms excitement/emotion. My Dad was literally speechless, nothing could come out of his mouth -- he had to leave the room. I posted a shorter clip of it below, but not sure if it you can view it on your phone. You can try viewing on your computer if you are really interested. 1. Sprout App. There are several iPhone apps out there, but the Sprout app is great. It is more high-tech than some of the others, showing you more in depth photos rather than fake pictures of the growing baby/babies. Not to mention all the health tips and pregnancy advice is helpful. Check it out! They have a free temporary version if you want to test it before you buy. 2. Vitamin Waters. I loooove me some vitamin waters lately. I particularly love the Tropical Citrus flavor. It's a nice change from the average water, and also gives you a bit of flavor and energy (sugar). I tend to pour it in a glass and add water. I find it a little too sweet. I don't mind the calories at all these days. In fact, I need them! According to WebMD, studies suggest that vitamin B6 for improves nausea, so I will take all the help I can get! 3. Belly Band. The belly band is a great invention. It's perfect for the first trimester, or anytime before you absolutely need maternity pants. And you know what? It would be fantastic for those holiday meals coming up. :) You basically just leave your regular pants unbuttoned and place the band over your waste. It looks like you are wearing a tank under your top! It's perfect. I wear them almost daily...unless I am rockin my new maternity pants. 4. Palmer's Lotions. While I am not totally sure that the Palmer's stretch mark cream works 100% to prevent stretch marks, I sure do love it. It smells yummy and feels great to hydrate my growing belly. I will continue to use it sporadically throughout the next 4-5 months and see how it goes. I guess I can follow up on this post sometime after May! 5. Pregnancy Pillow. Pregnancy pillows are the best. I pretty much stopped sleeping through the night at week 8-9. I would wake up at 3AM wide awake, starving. I would venture into the kitchen and grab some Greek yogurt and granola or cereal. I would also chug water and then try to go back to sleep. I'd maybe catch another 30 min to an hour of shut eye before my alarm would go off. But needless to say, this pillow really helps. It's very difficult to get comfortable with a growing/moving bump. 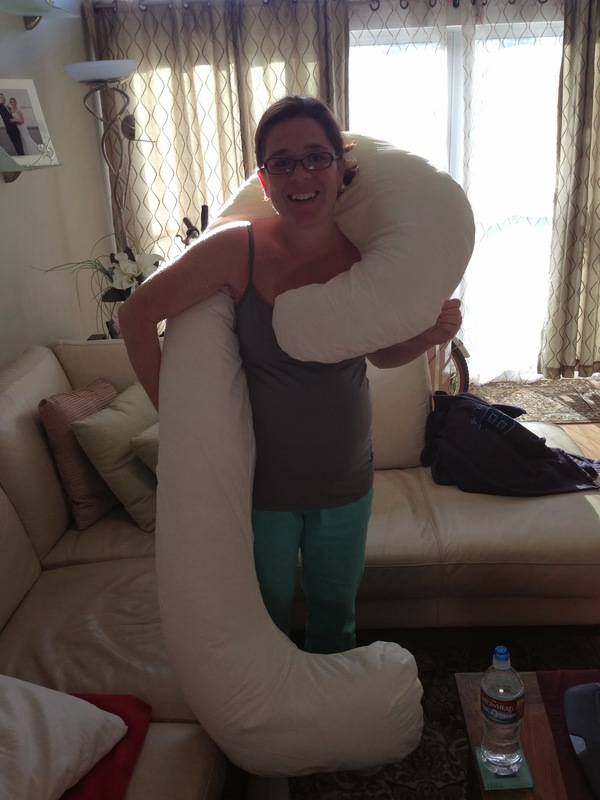 Too bad they don't make a traveling pregnancy pillow!! I have also been reading some twin websites and looking into twin support groups. My doctor and a few friends/fam have recommended reaching out to local moms in the area who have multiples or who are expecting multiples. For example, the 'National Organizations for Mothers of Twins Clubs' is a cute site, http://www.nomotc.org/. There is also a 'Southern California Mothers of Twins Clubs'. From there, I was able to enter my zip code and find this site, specific for West LA. I am also not embarrassed to admit that I have already started researching scholarships for twins. Haha -- it's never too early to check that stuff out! I love the video!!! I am so happy we got it on camera :) That belly band sounds cool and will save you money for awhile on clothes. 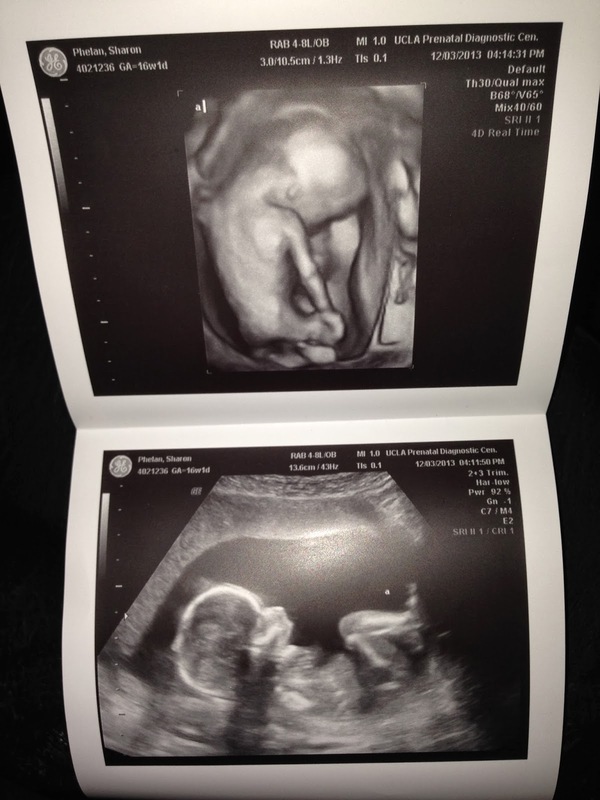 Those ultrasound pictures make me want to cry I am so excited for you guys!!!!!! !